Tokyo National Research Institute for Cultural Properties held the World Heritage Seminar with the theme of “Process of Evaluating Nominations and Roles of the Advisory Bodies for Inscription on the World Heritage List” at the Institute’s seminar room on January 18, 2018. This Seminar, held for the first time, is designed for local government officials in charge of matters related to World Heritage, and aims to provide information about the system of World Heritage and the latest trends as well as an opportunity for exchange of ideas. Focusing on the process of how the Advisory Bodies evaluate nominations, this year’s Seminar featured various speakers who discussed the actual details of what International Council on Monuments and Sites (ICOMOS), in particular, does, from different perspectives. First, Ms. Asuka SAKAINO from the Institute presented a report on the 41st session of the World Heritage Committee held in Krakow, Poland, in July 2017. Ms. Yoko FUTAGAMI, also from the Institute, then provided an overview of the World Heritage Seminar, and also described the evaluation process for the World Heritage List and problems with the current situation. 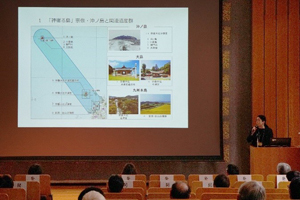 Another speaker featured in the Seminar was Ms. Miki OKADERA, Chief Engineer of the Fukuoka Prefectural Government, who played a critical role in the preparation of the nomination file for the Sacred Island of Okinoshima and Associated Sites in the Munakata Region and addressed the evaluation by the Advisory Bodies. She talked about her journey through the entire process related to the nomination of the sites, which was examined during the 41st session of the World Heritage Committee and inscribed on the list. In addition, Prof. Nobu KURODA of the University of Tsukuba shared her insights into the site mission from a professional viewpoint, based on her actual experience as one of the experts appointed by an Advisory Body to conduct a site mission in 2006. Finally, Prof. Toshiyuki KONO of Kyushu University, who was appointed president of ICOMOS in December 2017, delivered a presentation on the roles of the Advisory Bodies from the organization’s perspective. A total of 74 people attended the event, including officials from 29 prefectural or local government in charge of matters related to World Heritage as well as officials from the Cabinet Secretariat, the Agency for Cultural Affairs, and the Subdivision on World’s Cultural Heritage of the Council for Cultural Affairs. The Institute will continue to host such Seminars to communicate information obtained through the study of World Heritage and provide opportunities for people to share information. 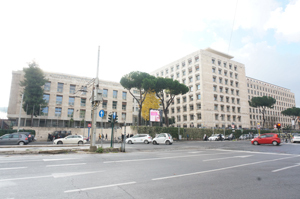 Representative from the Institute attended the 29th General Assembly of ICCROM (International Centre for the Study of the Preservation and Restoration of Cultural Property) held in Rome, Italy from November 18 through 20, 2015. 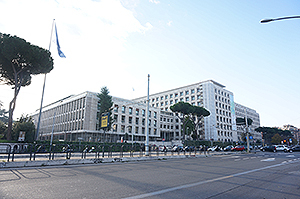 ICCROM is an intergovernmental organization, the headquarters of which was established in Rome in 1959 following the resolution at the 9th Session of the UNESCO General Conference in 1956. 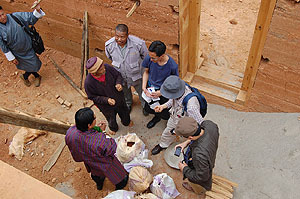 Known as an advisory body to the World Heritage Committee, ICCROM has been working on the conservation of various movable or immovable cultural properties. Our Institute has been contributing to its activities particularly through training on the preservation and restoration of cultural properties using paper and Japanese lacquer. 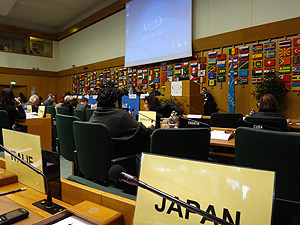 The General Assembly of ICCROM takes place every two years. As usual, new members of the Council were elected since almost half of its members’ term of office had expired. As a result, Mr. Wataru Kawanobe of our Institute was reelected as its member. 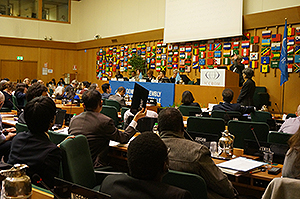 New Council members were elected from Ireland, Argentina, Iran, the Netherlands, Canada, Korea, Tunisia, Norway and Jordan, while the members of UAE and France were reelected. 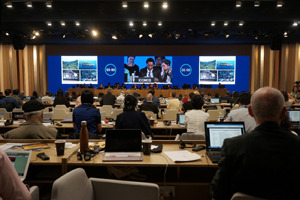 From this General Assembly in 2015, a thematic discussion was held and disaster measures and reconstruction cases were introduced from the member states under the theme of “Climate Change and Natural Disasters: Culture cannot wait!” During the course, the adoption of the “Sendai Framework for Disaster Risk Reduction 2015-2030” and “Sendai Declaration” at the third UN World Conference on Disaster Risk Reduction held in Sendai in March of 2015 was also addressed with a focus. We really felt the great expectations of the member states toward Japan in these areas. The Institute will proactively join these international meetings in order to collect global trends on the protection of cultural properties, as well as to transmit Japanese activities widely. Representative from the Institute attended the Annual General Assembly, Advisory Committee Meeting, and Scientific Symposium of ICOMOS held from October 26 through October 29, 2015 in Fukuoka. 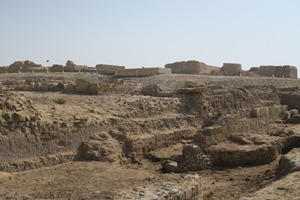 ICOMOS (International Council on Monuments and Sites) was established in 1965 as an international NGO for safeguarding and conservation of cultural properties in response to the International Charter for the Conservation and Restoration of Monuments and Sites (the Venice Charter) adopted in 1964. Since then, ICOMOS has been working as an organization where experts from various fields, including architects, historians, archeologists, art historians and anthropologists, interact with one another. 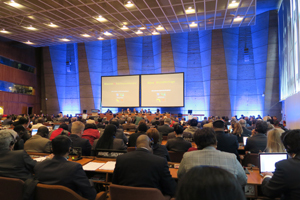 In recent years, ICOMOS has been well known for its other role as an advisory body to UNESCO by evaluating all nominations of cultural and mixed heritage to the World Heritage List. 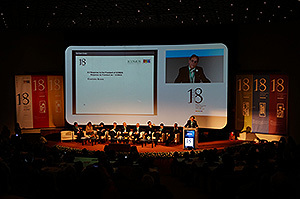 The General Assembly of ICOMOS had taken place every three years until 2014, when the Statutes of ICOMOS were amended at the General Assembly held in Florence, Italy. From 2015, the Annual General Assembly is to be organized every year together with the Advisory Committee Meeting. At this Annual General Assembly, the past activities of ICOMOS were reported to exchange opinions about how it could be a better organization, seeking measures for ICOMOS to work more appropriately as a group of specialists. In addition, a scientific symposium was also held under the theme of “RISKS TO IDENTITY: Loss of Traditions and Collective Memory,” where many useful cases were introduced to discuss the preservation and inheritance of tangible cultural properties, as well as their intangible values. The Institute will continually participate in such international meetings to identify global trends on the protection of cultural properties. 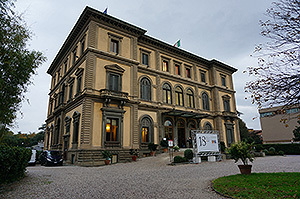 Representative from the Institute attended the 18th General Assembly of the International Council on Monuments and Sites (ICOMOS) that took place from November 9 to 14, 2014 in Florence, Italy. In light of the 1964 International Charter on the Conservation and Restoration of Monuments and Sites (the Venice Charter), ICOMOS was founded in 1965 as an international NGO to safeguard and conserve cultural heritage. ICOMOS has over 10,000 members worldwide, and is known for its work reviewing world heritage nominations as an advisory body to UNESCO. 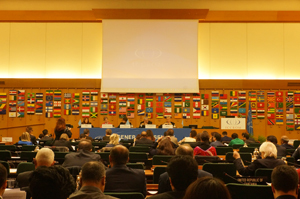 The General Assembly meets every 3 years to elect the Executive Committee and to hold an international symposium. At this Assembly, Gustavo ARAOZ was reelected as President and KONO Toshiyuki, a Professor at Kyushu University, was chosen as one of the 5 Vice Presidents. In addition, an international symposium “Heritage and Landscape as Human Values” was held. 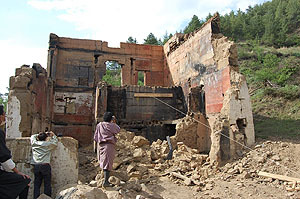 The symposium featured a wide range of presentations on issues that countries commonly encounter when safeguarding heritage, such as topics related to sustainability through traditional knowledge and community-driven conservation. 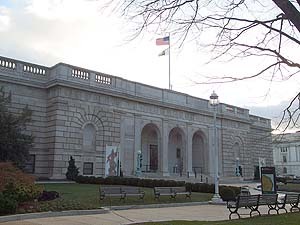 The year in which the General Assembly met also marked the 50th anniversary of the adoption of the Venice Charter and the 20th anniversary of the adoption of the Nara Document on Authenticity (the Nara Document). 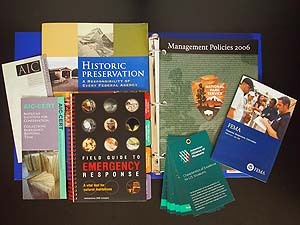 A panel featuring personnel involved in the adoption of these documents discussed the events leading to their adoption and subsequent developments after their adoption. The Institute will continue to gather and compile information on the safeguarding of cultural heritage overseas by attending international conferences like this in the future as well. 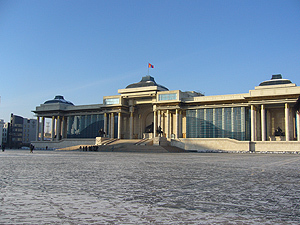 Four experts from the National Research Institute for Cultural Properties, Tokyo (NRICPT) were dispatched to Mongolia from January 21 to 27, 2012 as a part of the Networking Core Centers Project commissioned by Japan’s Agency of Cultural Affairs. On January 24th and 25th, workshops to draw up the management plan for Amarbayasgalant Monastery were held under the joint auspices of NRICPT, Nagoya University and the Ministry of Education, Culture, and Science of Mongolia (MECS). During the discussion, the protection of cultural heritage was considered along with the Land Law and the system of administrative courts. 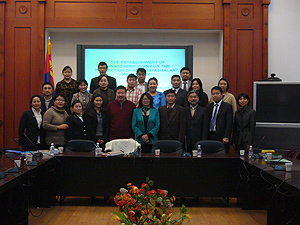 Accordingly, a written proposal to MECS and the Selenge Aimag (province) office was drafted. This proposal mentions establishment of a working group to include the Monastery on the World Heritage List and to draft a management plan, clarification of problems with the current regulations on protected areas, and efforts to obtain the understanding of local residents. NRICPT seeks to closely coordinate and cooperate with relevant bodies to bring the proposal to fruition. On January 26th, representatives of the NRICPT, Nagoya University, and the National Police Agency of Mongolia discussed the matter of illicit export and import of cultural properties. Representatives of the Police Agency explained national policies, systems, and criminal cases related to this topic. Representatives of the NRICPT informed them of cases of illegal mining and graffiti at the sites of Serven Khaalga and Rashaan Khadin Khentii Aimag, Mongolia.